Meeting Disney Characters and interacting with them is one of my favorite things to do! The rides stay the same, but every character interaction is different. Today I want to share with you my Top Character Meet & Greets at Hollywood Studios. Hollywood Studios has a big range of characters. You will find regular Disney characters like Mickey Mouse and Minnie. You will also find lots of Pixar characters, Disney Junior characters, and Star Wars characters. None of the characters at Hollywood Studios have Fastpass unlike characters at Disney’s Magic Kingdom. Be prepared to wait in long lines for many of these characters, especially the newer or popular ones. My top must do characters here are mainly ones you can’t find elsewhere on Disney World property. Woody, Jessie, and Buzz Lightyear. Buzz Lightyear meets alone and is located at the entrance of Toy Story Land or near Alien Swirling Saucers. Though he is available to meet here, I love his Magic Kingdom meeting place better since he has a permanent backdrop there. No FP is available for his meet and greet, the line is not shaded, and he does not sign autographs. Buzz has a stamp that he will stamp onto your book. 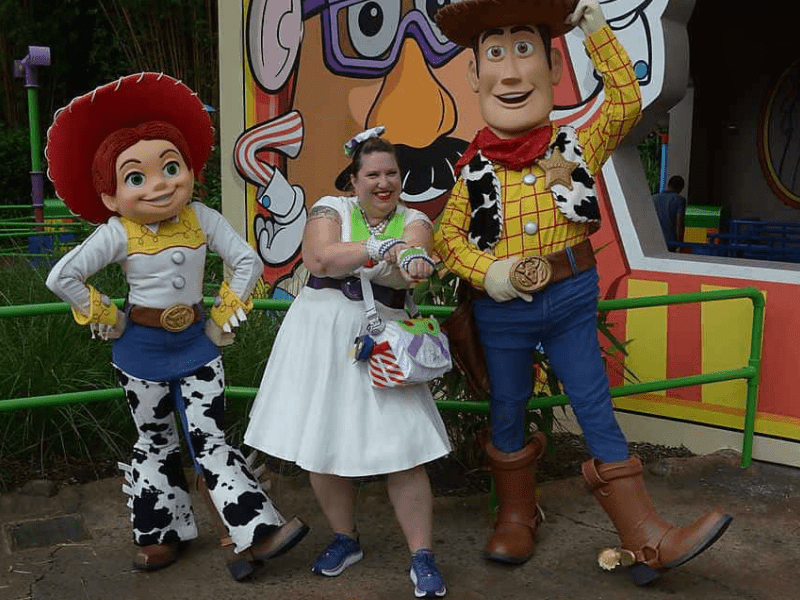 Julie in her fabulous Buzz Lightyear Disneybound meeting Jessie and Woody! Woody & Jessie meet together in front of Toy Story Mania. No FP is available for their meet and greet, the line is not shaded, and they do sign autographs. This line can get very long as this is the only place at Disney World to meet them and it is a very popular meet and greet. Toy Soldiers. You will find toy soldiers all around the Toy Story Land. Several times throughout the day, the Toy Soldiers march through Toy Story Land and do a quick interactive show. After the show, you can get photos with them most of the time. Edna Mode. 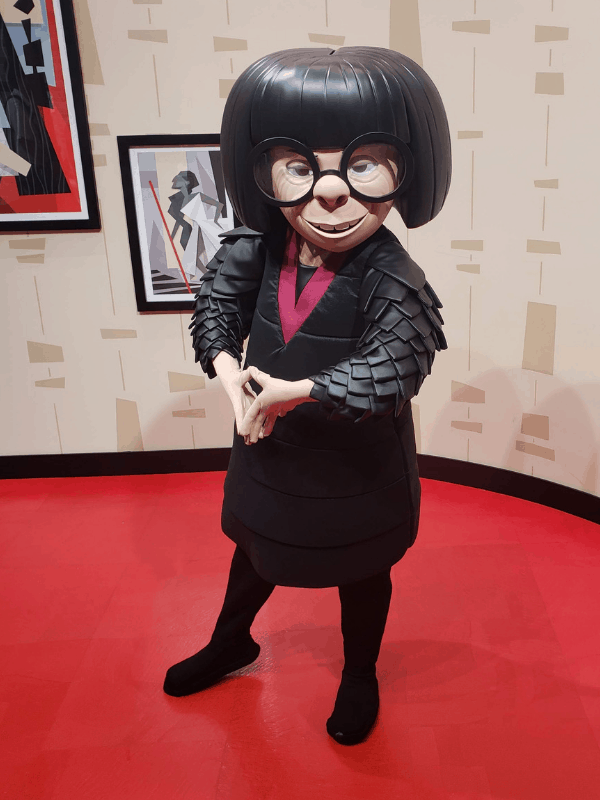 Edna Mode is located where Pixar Place used to be. They have redesigned the area as her showroom, showcasing several of the supers outfits. She is simply fabulous. Her queue is indoors unless she is super busy and then part of her line will be outdoors. She does sign autographs and FP is not available for her meet and greet. Olaf. His line is partly indoors and partly outdoors, but you are not in the sun so it is not that bad on a summer day. Don’t forget to give him a warm hug! Sulley & Mike. 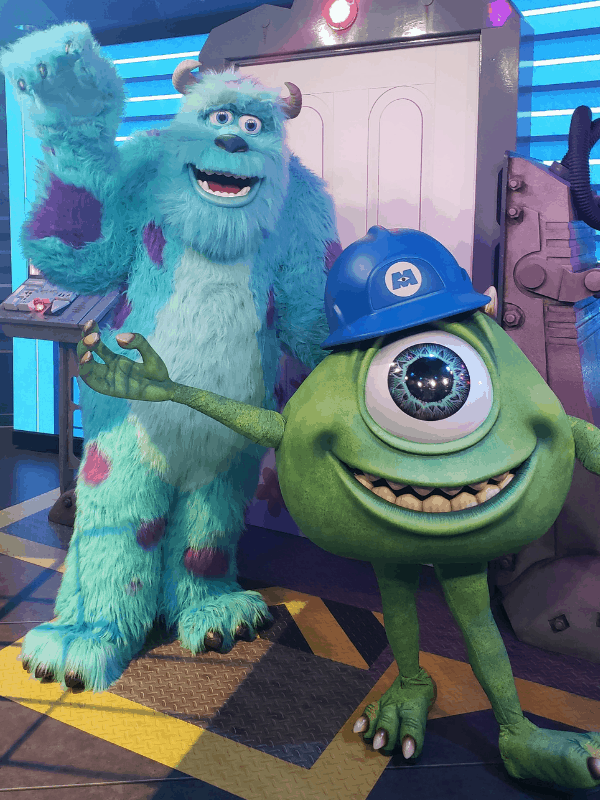 Sulley and Mike are located inside Walt Disney Presents (formerly One Man’s Dream). Disney World has been showcasing characters here for a while now, switching them out pretty consistently. So I would not expect them to stay for more than a year. Sorcerer Mickey. Sorcerer Mickey is my favorite! 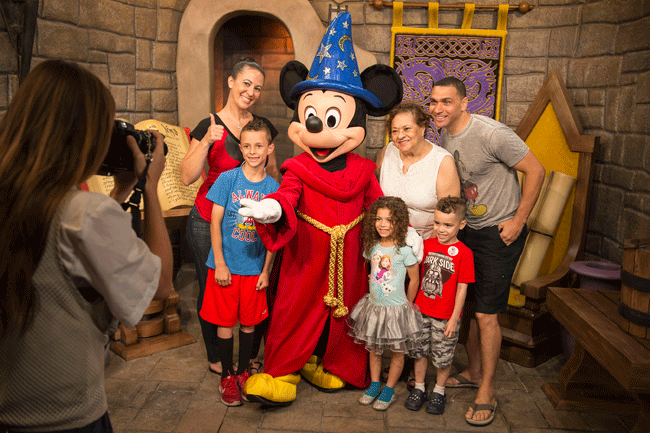 Guests can join Mickey in a scene from “Fantasia,” where he’s portraying his iconic role of the Sorcerer’s Apprentice. The scene is perfect! BB8. 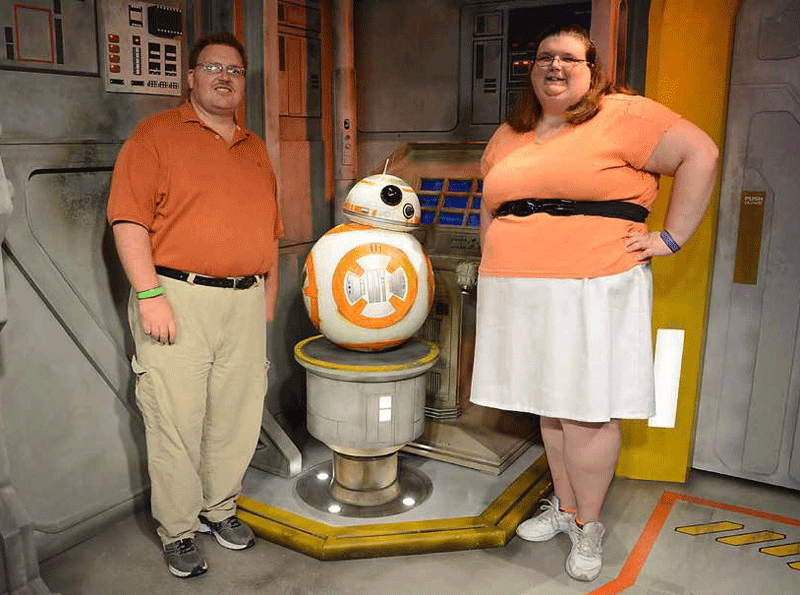 BB8 is one of the coolest character interactions there is at Walt Disney World! BB8 talks and interacts with you. A cast member helps interpret what he is saying but the movements let you know BB8 is really expressing his thoughts. I had a blast meeting him! Kylo Ren. If you are a Star Wars fan than Kylo Ren should be on your character meet and greet bucket list. He is kind of intimidating in a good way. He makes a very memorable interaction. Chewbacca. Chewie such a warm, huggable character. Even if you aren’t a huge Star Wars fan he is a must see. He gives great hugs. Both Chewbacca and Kylo Ren meet in the Star Wars Launch Bay, which is fully air-conditioned and a perfect escape from the heat. Doc McStuffins. Doc McStuffins meets right outside of the Disney Junior area. Her line is partly shaded but is outdoors. You can also meet her and all the Disney Junior friends at the Hollywood and Vine character breakfast. Vampirina. 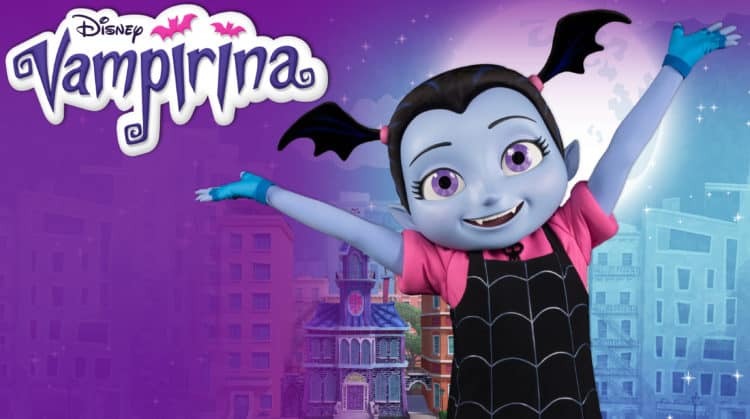 Vampirina is the star of Disney Junior’s Vampirina show. If you have Disney Junior fans, I am sure you have probably seen the show. She is super adorable and her friends call her Vee. Her line can get a bit long since she is very popular but the line is shaded. No FP is available. She does sign autographs. Vampirina also headlines the Disney Junior Dance Party. Princess Sofia/ Fancy Nancy. Princess Sofia is such an amazing little princess. Her show teaches little children how to be kind to others and so much more. She also meets in the Disney Junior area. She meets with grownups too! 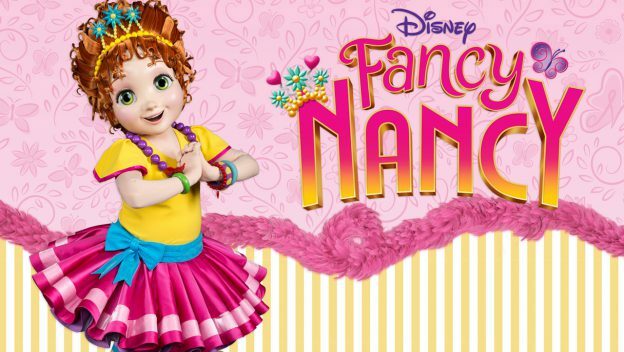 Starting May 1st, Nancy Clancy, the high-spirited young girl from Disney Junior’s hit animated series “Fancy Nancy,” is making “une grande entrée” into Disney Parks this spring! 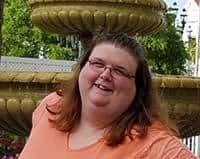 she’ll be meeting all her friends in front of her backyard playhouse. 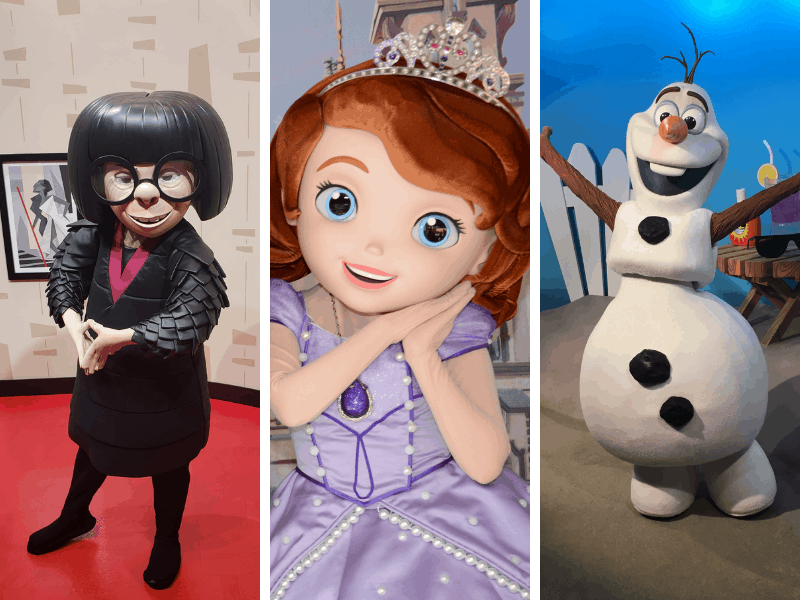 Nancy will also soon be part of the breakfast-time fun during Disney Junior Play ‘n Dine at Hollywood & Vine, the place to eat, play and laugh along with favorite Disney Junior friends including Vampirina, Doc McStuffins and Roadster Racer Goofy. Who is your favorite character at Hollywood Studios? 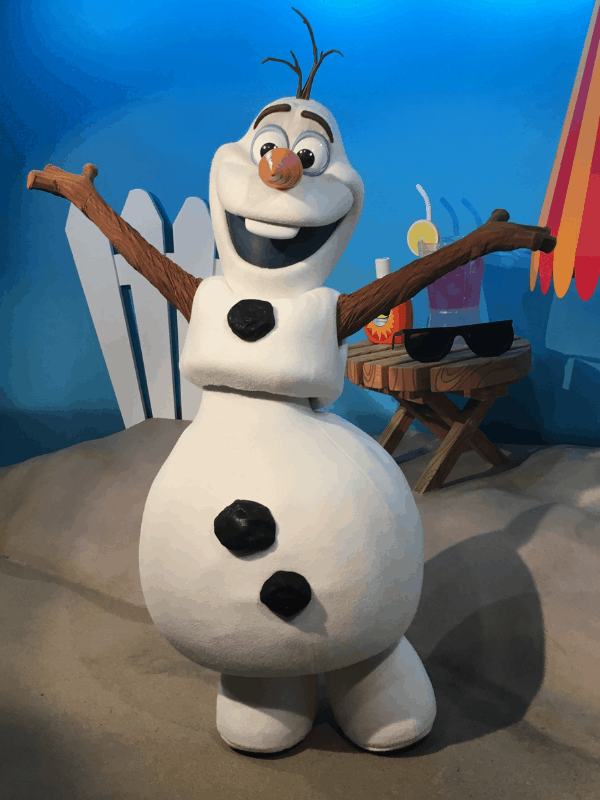 What character meet and greet do hope to make it to on your next Disney vacation? Let me know in the comments. Post Originally Published May 18, 2016. Save this to your Disney Vacation Planning Pinterest Board! I loved meeting characters at Disney!! Was so much fun even as an adult! Can’t wait to take my kids there! I know anyone from Frozen is top on my girls lists. They just love the movie. We loooooved meeting Olaf during our last visit to the Magic Kingdom. My toddler is pretty timid around characters, but he’s her favorite so it was worth a shot! Looks like such a fun time, I would love to take my kids to experience this someday but they are getting older. We weren’t able to afford a Disney vacation until the two oldest were 15 and 17, so we thought it would be more for the younger ones, who were 8 and 10. The teens loved every minute of it! In fact, at 46, it was my husband’s first visit and he tells everyone how great it was. We’re going back this year with my MIL and aunt (both retired). You’re never too old for your first visit! I miss living so close to Disney sometimes. We’d go every day. I made a point of meeting every single character and making a scrapbook before I left. How fun! I’d like to get some pictures of my kids with Chewbacca. Oh, you are so lucky! I wish we have one similar to this in our country so we can also explore. Omg so fun! I use to live in celebration (in Orlando) and would go to character meet and greets all the time! I didn’t realize you could meet some.of these characters! What a fun time! !